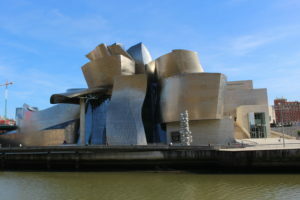 The Guggenheim Museum put Bilbao in the spotlights and on everyone’s radar or bucket list. Once a heavily industrialized city, it has transformed into a design city with a cosmopolitan attitude and a certain flair. Perhaps it lacks the sophistication and importance of a capital city but it slowly wins you over with its beautiful art, great atmosphere and the delicious food. Bilbao is pretty compact so you can discover most of the city by foot. If you follow the curve of the Nervion river, you literally experience the transformation of this bustling city. The river takes you from the old town to the newly developed and cultural hotspot with the Guggenheim Museum as main attraction. It is quite stunning, I found it most beautiful when the evening sun gave the titanium a kind of golden colour. Casco Viejo ‘the old quarter’ is a lively neighbourhood on the right bank of the Nervion river with many bars and restaurants. 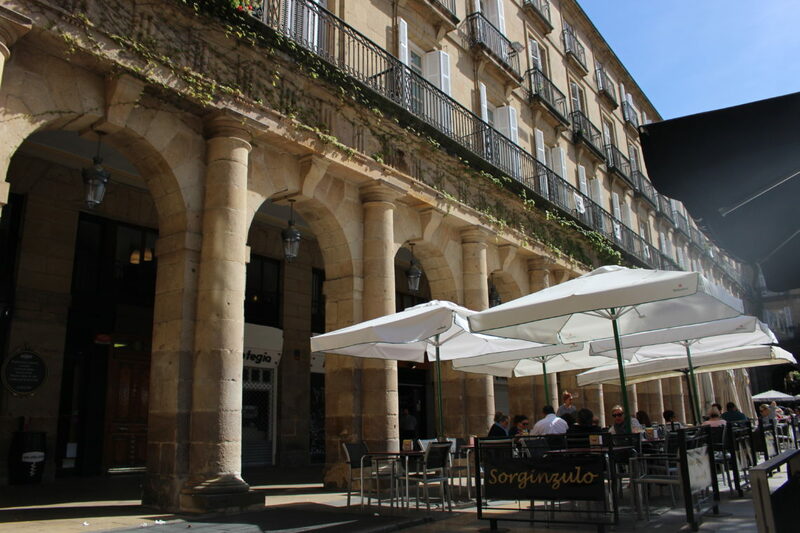 Plaza Nueva, beautifully surrounded by arches, is the heart of the old town and a great place to try out the famous pintxos, bite-sized rounds of bread with delicious toppings and spiked with a toothpick. 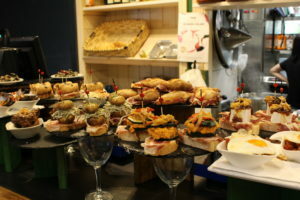 Locals do not stay in one bar all night but they perform the art of bar hopping, sampling pintxos and drinking local white or rosé whine, while they roam the streets and squares. When the city buzz or heat is getting to you, you can take the subway up north and stroll along the breathtaking Basque coast. Plentzia beach is the last stop on the metro line but it is definitely worth to sit the full ride. It is a quiet and sandy beach, located in a beautiful bay and has a wonderful promenade bordering it. www.caravan-cinema.com nicely decorated and comfortable rooms, friendly staff.